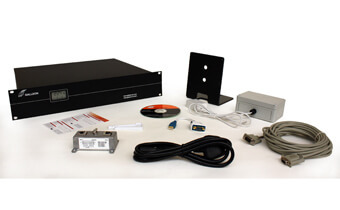 The TS-900-DCF Network Time Server solution consists of an DCF clock, DCF antenna and NTP software (TimeSync). The DCF clock is attached to windows PC and the supplied TimeSync software once installed configures the machine as a Stratum 1 NTP time server. A two line display on the TS-900 unit shows run-time information for the DCF subsystem and UTC time. Sitting safely behind your company firewall the TS-900 provides an elegant solution allowing a Windows Server or a Domain Controller to supply accurate, secure UTC time to any other machine or digital clock on your network. Installs as a service on a Windows Server adding Stratum 1 NTP Time Server functionality. Supports NTP and SNTP compatible clients. Front Panel display to easily assess Time and Satellite Status. DCF time reference input + 5m cable. Extension box and wiring tool included - GPS antenna cable length can be extended up to 1,000m (3,000ft) if required. Email warning if DCF synchronisation is lost. Lifetime Technical Support by phone or email. TS-900-DCF unit + Power Lead. DCF Antenna + power supply.